Mary Bartlett Bunge, Ph.D., professor of cell biology, neurological surgery and neurology at the University of Miami Miller School of Medicine’s Miami Project to Cure Paralysis, has been elected to the National Academy of Sciences Institute of Medicine, an extraordinary honor that reflects the height of professional achievement and commitment to service in health and medicine. Bunge, who joined the UM faculty 24 years ago, has worked for nearly four decades on the Schwann cell, which she and her late husband, Richard Bunge, M.D., determined to be a key to helping repair damaged spinal cords. Her work with Schwann cells has led to numerous discoveries and is now central to The Miami Project’s phase one clinical trial to evaluate the safety of transplanting the Schwann cells of recently paralyzed patients into the site of their injury. This work will serve as a foundation for future cell replacement and regeneration trials at The Miami Project. 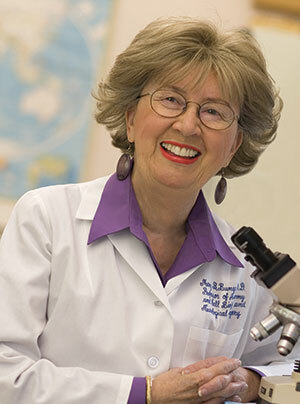 "Dr. Bunge’s distinguished scientific career has spanned more than 50 years, a period during which she not only made numerous seminal discoveries but also helped advance the careers of many other distinguished scientists," said Pascal J. Goldschmidt, M.D., Senior Vice President for Medical Affairs and Dean of the Miller School. "We are delighted that the Institute of Medicine values her accomplishments, expertise, and service as much as we do. We are all extremely proud of Dr. Bunge." True to her characteristic selflessness, Bunge shared credit for her honor with her mentors, her husband with whom she worked for nearly 40 years, and Patrick Wood, Ph.D., research professor of neurology, and the numerous outstanding students and fellows who trained in the Bunge-Wood laboratory. "I am very surprised but very deeply honored to have been selected to be a member of the Institute of Medicine," said Bunge, the Christine E. Lynn Distinguished Professor in Neuroscience. "Ever since childhood I have wanted to make a difference and do something worthwhile. I hope that this honor helps confirm that I have achieved this goal." "Throughout my career, I have had very exceptional mentors so have been very fortunate in being able to fly on the wings of eagles." An internationally recognized authority on central nervous system regeneration, Bunge has received many other prestigious honors over her career, including the 1996 Wakeman Award for her seminal contributions to the understanding of spinal cord injury repair and the Javits Neuroscience Investigator Award from 1998-2005 from the NIH’s National Institute of Neurological Disorders and Stroke (NINDS). In addition to serving on the NINDS council, she served on the Institute of Medicine’s Committee on Spinal Cord Injury from 2003-2005 and received an honorary doctoral degree in Humane Science from her undergraduate alma mater, Simmons College, in 2006. In another remarkable achievement, the NIH recently renewed Bunge’s 39-year-old individual research grant for another five years. She also has been honored for her leadership in advancing the careers of women in neuroscience, receiving the inaugural Mika Salpeter Women in Neuroscience Lifetime Achievement Award in 2000. She was named the Christine E. Lynn Distinguished Professor in Neuroscience in 2003 and was given the Lois Pope LIFE International Research Award in 2005. She is also a member of the University of Miami’s Iron Arrow Honor Society and received the University’s Distinguished Faculty Scholar Award in 2012. Established in 1970 by the National Academy of Sciences, the Institute of Medicine is widely recognized as the nation’s leading resource for independent, scientifically informed analysis and recommendations on health issues. New members are elected by the Institute’s existing members, who number about 1,900 health care professionals as well as luminaries in the natural, social, and behavioral sciences, law, administration, engineering, and the humanities. Bunge joins five other University of Miami faculty as Institute members. They are President Donna E. Shalala, who was elected in 2000; Charles Nemeroff, M.D., Ph.D., Leonard M. Miller Professor and Chairman of Psychiatry and Behavioral Sciences and Director of the Center on Aging, who was elected in 2002; Margaret Pericak-Vance, Ph.D., the Dr. John T. Macdonald Foundation Professor of Human Genomics and Director of the John P. Hussman Institute for Human Genomics, who was elected in 2003; Diana D. Cardenas, M.D., M.H.A., professor and Chair of Rehabilitation Medicine, who was elected in 2004; and Carl Eisdorfer, M.D., Ph.D., Knight Professor and Chairman Emeritus of the Department of Psychiatry and Behavioral Sciences, who was elected in 1975.